Christmas. A tree with presents piled underneath and stockings hung by the fireplace. Growing up, we’d always wake up early and try to whisper quietly for as long as we could stand it. Our morning would start with emptying stockings and amazing homemade cinnamon rolls. We’d then sit around the living room floor and go into the presents! So many great memories. We know you can buy presents on a budget, but what if you simply don’t want to have your focus on gifts this year? 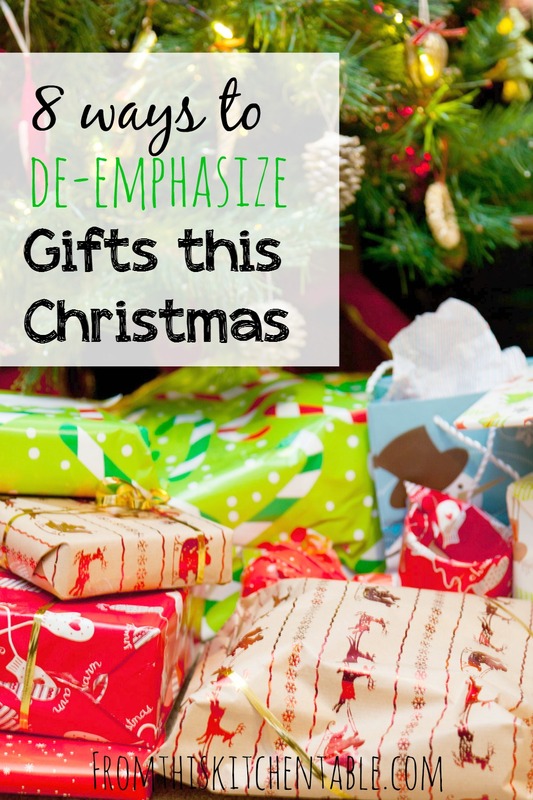 What if you want to take the emphasis off of gifts? What can you do to help your children know that Christmas is more than just presents? 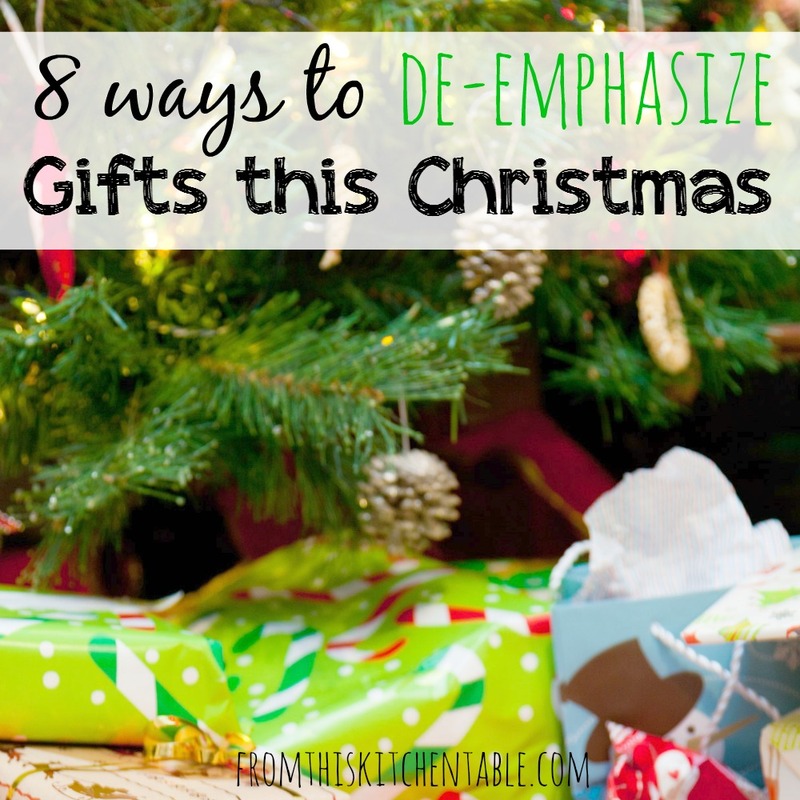 I have come up with 8 ways of taking the emphasis off of gifts at Christmas. Choose what works for you and take baby steps. If you uproot everyone of your traditions at once, your day might be spent with a lot of tears. Young children won’t understand your verbalization of why you are doing things differently. This is a great first baby step. Instead of doing no presents, simply have fewer and then incorporate a few other ideas into your day. Christmas doesn’t have to be this big elaborate deal. You don’t have to spend hundreds of dollars and have stacks of presents for each child. Be selective about what you buy. Your children don’t have to have everything on their wishlist. They might even appreciate what they do receive more than when their attention is divided between so many new things. Stuff a stocking with little goodies for each family member but forgo individual presents and instead buy something everyone’s been wanting or go someplace fun! Purchase some new movies, video games, board games, a swing set, trampoline or something that the entire family can do together instead of tearing through piles of presents. Spend the rest of the day creating memories and enjoy the one big gift. Go to the movie theater, rent a hotel room and use the indoor pool. If you live where it’s warm, take a trip to the beach or park. There are a lot of options if you think out of the box. Trampoline Park, museum that’s always been a little too pricey to make your budget cut, ice skating. This will, of course, depend on the age of your kids and interests in your family. Add in special snacks and treats you wouldn’t normally have and make Christmas about the memories instead of the rush of opening presents that’s over in minutes. If the experience you select isn’t open on Christmas day, spend the day relaxing, cookie decorating, movie watching, or serving and go on your adventure in the next week or two. The family gift and experience gift both downplay gifts but you can take it a step further. Look around your area and find a service project your family can be involved in on Christmas day. Maybe help serve a Christmas meal. I can guarantee your family will bond and you’ll remember this Christmas forever. Growing up we spent several Christmases delivering Christmas meals that a local church put together to those that are home-bound. Contact your local nursing and assisted living homes. Spend a little time on Christmas talking with the residents that are spending the day without family. Listen to their stores, sing carols with them, let them enjoy being around your kids. You can either skip gifts all together and maybe have your family pick out items from the World Vision Gift catalog to enrich the lives of others around the world or give the difference of what you normally spend to an organization you select together. Keep your ears open around your work, church, areas of activity etc for those that have no place to go for the holidays. Invite them into your home, let them spend time with your family, enjoy a meal together, bring out the games and have a great time. Christmas doesn’t have to be a day that revolves around gifts for your kids to cherish. Select some ways to take the emphasis off of gifts this year, you won’t regret it. Focus on family, memories, serving, and others this year and it will be a Christmas you’ll remember! Have you tried taking the emphasis off of gifts at Christmas in your home? Or if recipes are more your thing, I have a fantastic fudge recipe you need to try! This entry was posted in Christmas, Faith, Family, Uncategorized on November 19, 2014 by Deanna Michaels. Great ides. I love the idea of serving! We need to look for way – outside of the normal activities. I love the family gift idea and the experience gift! I would also love to look into serving. It does seem we gift less as the kids get older, however, the gifts are more expensive;0) We also usually adopt at least one student each year and have the kids help with wrapping. lol! Very true. Gifts become more expensive as the kids get older. Thankfully, we aren’t there yet! 😉 Love that you guys adopt a student each year. We always have our kids make a shoebox for Samaritan’s Purse and once they get a little older I hope we can volunteer with them to serve a meal. Great ideas! We don’t have kids yet, but I plan on taking this approach of taking the emphasis off gifts and putting it on giving back to others. Love this! Thanks, Jen! I really like not having a huge emphasis on gifts. I figure too that it’s easier to add later than it is to take decrease the emphasis on gifts when they already have so many expectations. Thanks, Pamela! Agreed. We can give our children the most expensive gifts but if we don’t give them our time it doesn’t really mean that much. Love your ideas of gifts of books, writing supplies, and time! My daughter loves when we read to her. These are wonderful ideas. We have had several seasons of unemployment and it’s caused us to really evaluate what Christmas means for our family. It’s interesting to see how content our children are and that they don’t “need” certain gifts to make Christmas meaningful to them. Thanks for sharing with us at Simple Lives Thursday; hope to see you again this week. Thanks, Angie! I’m sure your kids’ responses have had a lot to do with how you you’ve raised and parented them over the years! You guys will have great memories from these Christmases! Thanks for being such a great host. Looking forward to Thursday! Oh my goodness, yes, I relate on things getting played with once. And the problem with that is whenever they open said gifts in front and grandparents and play with them immediately after they think they love them but you know that once you are home, they won’t get touched again. . .
Love your ideas! He’ll have a blast at Chuck E Cheese and stuff for the tree fort is great. That’s about how I shop for my babies too. 🙂 I don’t even remember if I got my then 7 month old anything last year. Surely there was something but I can’t remember it. Pingback: Christmas is about love, family, and Christ not gifts!